In Gas Flushed (MAP) Food Packages. 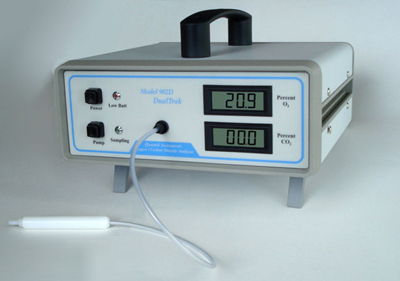 The Quantek Model 902D is a benchtop oxygen and CO2 headspace analyzer, primarily used for gas flushed food packages. Achieve accurate oxygen and carbon dioxide measurements in 20-25 seconds.This headspace analyzer contains an internal pump to draw in sample from your package and display O2 and CO2 concentration results in 30 seconds. The expected oxygen sensor life is typically 5 years, unlike other analyzers with a sensor that last 1-2 years, reducing total cost of ownership, and analyzer downtime. The Model 902D analyzer sample probe is tipped with a particulate filter and luer fit syringe needle with side-port holes to prevent plugging. When the pump is activated, sample is drawn through the probe and tubing and then to the oxygen sensor. The pump is electronically timed to draw in the precise amount of sample required for the analysis, and then turns itself off after the pre-set sampling time (5 to 10 seconds). The O2 and CO2 concentration is read on the display within 20-25 seconds. The solid-state infrared CO2 sensor has no moving parts, a compact optical cell, and microprocessor-based calibration factors using a 6th order polynomial equation and 32 bit processor to linearize the full range measurement up to 100%. Both sensors are unaffected by high levels of background gases such as nitrogen. The expected life of the CO2 sensor is theoretically unlimited, as it contains no moving parts. The expected electrochemical O2 sensor life is typically 5 years, unlike other analyzers with an electrochemical sensor that last 1-2 years. The rugged miniature diaphragm pump has electronically controlled timing function to operate only when sampling. It provides high flow rate and long operating life. The pump is electronically timed to draw in the amount of sample required for the analysis, and then turns itself off after the pre-set sampling time (5 to 10 seconds). If equipped with the optional battery, the 902D can within transported to your facility to conduct testing with no AC outlet available. Totally sealed, long-life battery (optional) accepts full or partial charging cycle. Charger module plugs into standard 115V outlet for charging or continuous operation, though it can accept 100-240V for worldwide use. Micro-processor based electronics provide sensor signal processing, battery charging, pump timing and on/off control for high accuracy and reliability with minimal component use and reduced size and cost. O2 Calibration Frequency: Weekly; set with room air set to 20.9% O2. CO2 Calibration Controls: Potentiometer SPAN adjustment for CO2. CO2 Calibration Frequency: Every 18 months; calibration gas recommended. Origin of Goods – Our products are manufactured in the U.S.A.